Are you planning a summer meeting or corporate getaway? 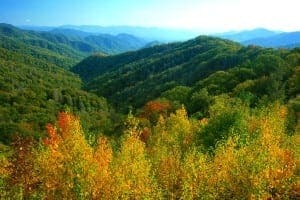 Sevierville TN is the place to plan your stay. ConventionSouth, a magazine that focuses on meeting planning destinations throughout the country, has named Sevierville TN the number one ‘Top Cool Spot’ for summer meetings for large groups. There were a total of 12 destinations considered, one being Sevierville TN. Thanks to ConventionSouth, its readers and loyal Facebook followers, Sevierville quickly rose to the top of the list! Sevierville TN has been a popular destination for corporate events and meetings for years. The new Sevierville Events Center helps make the town a great place for large retreats and corporate events. In addition to the meeting areas available in Sevierville, there are plenty of wonderful restaurants, shows and attractions for large groups to visit throughout the stay. When you’re planning your trip to the Smoky Mountains, don’t forget about the beautiful Pigeon Forge, Gatlinburg and Sevierville cabin rentals available. Aunt Bug’s Cabin Rentals welcomes guests to stay in their group cabins for a relaxing experience in the Smoky Mountains. Some of the cabins feature an indoor fireplace, perfect for gathering around for after-dinner discussions. No matter what time of year you’re planning a meeting or a weekend getaway, the Smoky Mountains are the perfect place to retreat. To begin planning your stay in one of our fully-equipped cabin rentals in Sevierville, Pigeon Forge and Gatlinburg, give us a call at (800) 953-5655. We would love helping you plan your corporate meeting getaway to the ‘Top Cool Spot’ in the Smokies!